Citroen’s ‘Cactus’ – fancy driving around in bubble wrap? A dent-proof car? Woah! For a minute there, we were getting worried here at Smart Finish. That’s until we realised Citroen’s new dent-free car is the equivalent of driving around in bubble wrap! That, combined with the fact that most people can’t drive a stick, means we’ll be in business for a few more years. In a world first, the French-made Citroen Cactus has large rubber panels on the doors, with air bubbles that can absorb the impact of a runaway shopping trolley travelling at 40km/h — with 40kg of groceries on board. Shopping trolley dents and other dings cost car owners and the insurance industry millions of dollars in minor repairs each year. But dent removal experts say they don’t believe the Citroen Cactus will damage their business, because the car is sold in relatively small numbers — and the full size protection strips with built-in air bubbles are unlikely to be fitted to other models. There is just one catch with the dent-free car. 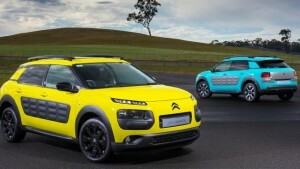 You need to be able to drive a “stick shift” manual transmission to buy the cheapest version of the Citroen Cactus. They were not aware the word ‘Cactus’ in Australia can also mean something doesn’t work any more or has conked out, as in “she’s cactus”. So, until you’re ready get Cactus 😉 you can call Smart Finish. We’ll help you fix your bumper dents and scratches. No worries mate.